Chuckawalla (Sauromalus obesus). Desert regions ranging from southwestern Utah, southern Nevada, western Arizona, Mojave and Sonoran deserts, and Baja California. The chuckawalla prefers the rockier elevations (up to 4500 ft) though they are also common in lower elevations. As with other diurnal lizards, they may be found sunning on exposed boulders or rocks; several of them may be found basking together. Desert Iguana (Dipsosaurus dorsalis). Desert regions ranging from southern Nevada, western Arizona, east-central California, down into Baja California, and Sonora and Sinaloa in Mexico. In the Mojave and Sonoran deserts, this lizard is found in the sandy flats and hummocks typical of the creosote woodlands. The desert iguana is often found in the vicinity of creosote bushes, which provide food and shelter and the burrows of kangaroo rates, used by the iguanas to hide from predators. The burrow are also used to avoid the the hottest part of the hot desert days. The chuckawallas may reach up to 18 inches (45.8 cm) STL, making them the second largest U.S. lizard (the gila monster, Heloderma horridum, being the largest). 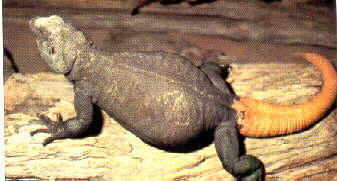 Their chunky body (its former species name was aptly obesus = obese) is about equal in SVL to their tail length. The desert iguanas reaches about 16 inches (40 cm) STL, with their SVL at about 4-5 inches (10-12.7 cm). While it has the same overall body and head shape as the chuckawalla, desert iguanas are less massy overall, with a finer head. Very stout, flattened dorsoventrally (omalus/homalus = flat). Short rounded tail encircled with slightly keeled scales; rough sandpapery skin. Lacks the dorsal crest or ridge common to other iguanids, such as the desert iguana. Defends self by crawling into tight crevice and inflating itself with air, wedging itself firmly inside. Can only be removed by killing it or dismantling the rock structure (a very good reason to get your chuck habituated to human contact!). Vary in color from deep, dark brown, to dark head with orangy body. Tail may be ringed with black and white bands. Like to bask up on rocks where they can survey their surroundings. by Wayne Van Devender Stout bodied; may inflate body with air when disturbed. Short dorsal crest. Long, round, thick tail; can drop and regenerate. Dewlap on neck. Legs thick and powerful; a very fast runner. Ground color of light brown marked with irregular bars and spots of which; sides and belly pale or white. 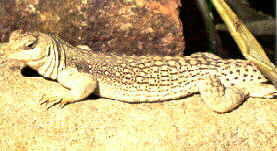 At a distance, the effect may be of an all white lizard; the result is that this lizard blends in quite well with its native sandy, rocky areas. As these are desert lizards, they require a desert environment. A large enclosure (100 gallon or larger) is ideal. Clean playground sand (available in 50 lb bags at hardware stores) makes an appropriate substrate when poured to a depth of 3 inches. The sand can be mixed with larger rock particles, such as clean gravel. Flat rock for climbing basking; cholla cactus skeleton or other structure for climbing on or hiding under help vary the habitat and create microenvironments. At least one hiding area should be placed in the cool end of the enclose, and one in the warm. It is not unusual to find diurnal desert species hunkered down in a cooler burrow, cave or deep rocky crevice during the hottest part of the day. Provide such areas for your lizards to enable them to behaviorally thermoregulate as they would in the wild, which will ultimately reduce the total load of stress related to being in captivity. When using rocks or other heavy objects, place them directly on the enclosure floor, building the sandy/gravelly substrate up around them. Use aquarium silicone cement to glue the different rocks used to create mounds or caves together. Securing them in these ways will help ensure your lizard does not become mush if any of the structures collapse on them when the lizards burrow under the sand. Place a small dish of water in the coolest corner. Desert animals are adept at finding and exploiting water resources, so the chuckawalla and desert iguana will soon learn what that bowl of water is for. Since they cannot tell you when they are thirsty, keep the bowl in there all the time. Placing the bowl on the cool side of the enclosure will help keep the overall humidity down. The creosote bush (also known as chaparral, and greasewood) plays an important roe in the desert iguana life. They eat the leaves and flowers, and burrow around the roots and rocks around the base of the plant for shelter and to avoid predators. You may be able to find seedlings for sale at plant nurseries, especially ones specializing in native flora. Since they require a rather damp rooting medium, it would be best to set the potted creosotes into the sand and cover with a layer of gravel or rock both to keep the damp in the pot and providing some support when the lizards come to eat. Additional information on plants, including suggestions for desert habitats, can be found in the Plants page. Coming from similar environments and exploiting the same microhabitats, they both require a thermal gradient ranging from the low 80s F(26 C) on cool side up to 100 F (37 C) on the warm side. In addition, they require a basking area of up to 110 F (46 C) to enable them to reach their preferred body temperature. At night, the basking area is shut off, and the thermal gradient is allowed to drop to the 60-high 70s F (15.6-25 C). At night, you will probably need to use an appropriate nonwhite light producing heat source to be able to provide the nighttime thermal gradient they require. Options include a nocturnal reptile light or a ceramic heating element. Note that herbivorous lizards' digestive systems start optimum working at 88-90 F, so having the proper thermal gradient established will enable them to thermoregulate to attain and maintain the temperatures they need day and night. Do not guess at the temperatures - use thermometers or other temperature reading devices to regularly monitor the warm and cool end day and night, and the basking area temperatures during the day. High need for UV lighting. Use two UVB-producing fluorescents, such as the Durotest Vita-Lite (the Powertwists provide more UV than their regular smooth tubes) or Zoo Med Reptile light (5.0+). The UV-producing lights, as well as the daytime white light/basking lamps should be placed on a timer with a 12-14 hours on, 10-12 hours off schedule. UVB disperses quite rapidly requiring that these fixtures - with their lights not filtered through glass, plastic or dense mesh - be installed no farther than 12" from the lizard. The UVB-tube should extend across the enclosure, with the basking lamp mounted close enough to it in the warm end so that basking lizards get both the heat and UVB exposure. Slightly omnivorous. Leafy dark greens (collards, mustards, dandelions, escarole, parsley, grasses (pesticide free! ), shredded green and orange vegetables, soft fruits, flowers such as hibiscus, roses, dandelions, nasturtium, geranium (leaves and flower heads). Cactus pads (trimmed) and prickly pear. Insects (worms, crickets) and, for larger lizards, mouse pinks, provide occasional animal-based protein. Herbivorous. Leafy dark greens (collards, mustards, dandelions, escarole, parsley, grasses (pesticide free! ), shredded green and orange vegetables, soft fruits, flowers such as hibiscus, roses, dandelions, nasturtium, geranium (leaves and flower heads). Cactus pads (trimmed) and prickly pear. Supplement with multivitamin and calcium supplement. I have come to another conclusion, based in large part upon what I have learned about the misinformation that self-perpetuated itself through the years about green iguanas, and the research of John Iverson and others who have spent years studying iguanines. Trained observations of wild desert iguanas and chuckawallas, as well as analysis of gut contents and structure of their colon, all point to these lizards being completely herbivorous at all life stages. However, it has been reported by some desert iguana keepers that, when coming out of hibernation, their lizards seem to require some crickets to get them interested again in eating their plant food. This doesn't necessarily make them omnivores as stress-induced behavior (and make no mistake about it: captivity is stressful, no matter how good the conditions of captivity) does not make that behavior "normal". It may mean that, in order to get a quick burst of energy, these most northern of the desert/tropical iguanids consume small amounts of animal matter, moving back to a strictly herbivorous diet a week or so out of hibernation. If anyone has research which documents omnivory, or any ontologenetic shift from carnivory or omnivory to herbivory, in wild populations (which does not include lizards lounging around tourist spots), I would be very interested in a copy of the article(s) or its citation. Because of the problems associated with captive herbivorous reptiles getting sufficient calcium and manufacturing enough D3, the importance of properly installed UVB-producing lights in conjunction with feeding a healthy diet, and supplementing with multivitamin and calcium (especially females who may become gravid), cannot be stressed enough. The chests, heads and limbs of the common chuckawalla males are generally black, flecked or spotted with gray. The rest of their body is red or light gray, depending on age and local, and the tail, yellow. Females tend to retain their juvenile banding. Young chucks are crossbanded around the body and tail, with the bands on the tail being most conspicuous. In Utah, all adults are banded. The male western chuckawallas have more uniformly colored crossbands and adult male body color is often suffused with red. Breeding is in April-May, with clutches of 5-16 eggs laid in June-July. There is little in the way of sexual dimorphism in desert iguanas. Both get pinkish to buff patches on their sides when in breeding season. Sexually mature males will have the enlarged hemipenal bulge at the base of the tail. Breeding is in April-June, with clutches of 2-8 eggs laid a month or so later, hatchlings emerging in July-August. Desert iguanas may double clutch. Generally speaking, the lizards dig tunnels in which they lay their eggs. Hatchlings are 3-4 inches (7.-10 cm). In general, desert lizards can withstand enclosure temperatures down to 50-55 F (10-12.8 C). If the ambient room air temperature in which the enclosure is kept falls below this temperature, supplemental heating to must be provided to ensure that temperatures do not fall below this level. Hibernation starts somewhere in November and may extend through February/March. To ensure that the lizard does not enter the period of low temperatures with food still in its digestive system, the lizards should not be allowed to enter into hibernation/brumation after eating their usual amount of food. While wild chucks and desert iguanas have been found with some digesta still in their proximal colon, care must be taken that the gut isn't full as, during the prolonged period of cold temperatures, the gut activity slows to a stop, but decomposition of the food may occur. The change in season can be artificially provided by the gradual lowering of the hot temperatures of "summer", in combination with increasing the length of the night period and decreasing the day length, during the fall and early winter. Make sure they have water available during this time. Begin increasing day length and increasing temperatures as day length and temperatures begin to rise in the late winter/early spring. It is not known how biologically important it is for chuckawallas and desert iguanas to hibernate/brumate during the winter. Not undergoing an annual hibernation/brumation may ultimately have no effect that could result in early death or disease. Or, it might. It may or may not have any bearing on whether the hormonal changes associated with breeding season and mating will be triggered appropriately or not. Have fresh water available for the lizard and the normal temperatures and day length ready to go for when the lizard emerges from hibernation. It is not unusual for them to be a bit sluggish for a couple of days, as their metabolism and other systems adjust to the change. Offer fresh food as well, once they are out, replacing it daily if not eaten. If they haven't started to eat by the third day or so, try offering a pungent herb or, if available, creosote leaves. This may act to stimulate feeding. Keep males alone or in harem groups. Femoral pore plugs used to mark territories. Secretions/rubbings detected both chemosensorily as well as visually. Tail autotomy occurs in both species. Chucks are able to evade predators by entering a rocky crevice and taking a deep breath, bloating their body size, effectively wedging themselves in the space, making it difficult to impossible for a predator (or lizard keeper) to dislodge them without deconstructing the rocks forming the crevice. Both species, along with other desert species, should be considered species of special concern due to the continued development of desert areas for human habitation and business as well as the deleterious effects of recreational and other human noise pollution. Case, Ted J. 1988. Ecology and evolution of the insular gigantic chuckawallas, Sauromalus hispidus and Sauromalus varius. In, Burghardt GM and Rand AS (eds.) Iguanas of The World: Their Behavior, Ecology and Conservation. Noyes Publications, Park Ridge, NJ. Iverson, John. 1988. Adaptations to herbivory in iguanine lizards. In, Burghardt GM and Rand AS (eds.) Iguanas of The World: Their Behavior, Ecology and Conservation. Noyes Publications, Park Ridge, NJ. Nagy, Kenneth A. 2001. Food requirements of wild animals: predictive equations for free-living mammals, reptiles, and birds. Nutrition Abstracts and Reviews, Series B 71, 21R-31R. Obst, F. J., et al. 1988. Completely Illustrated Atlas of Reptiles and Amphibians. TFH Publications, Inc., Neptune City, NJ. Ryan, Michael J. 1988. Variation in igunanine social organization: Mating systems in chuckawallas (Sauromalus). In, Burghardt GM and Rand AS (eds.) Iguanas of The World: Their Behavior, Ecology and Conservation. Noyes Publications, Park Ridge, NJ. San Diego Museum of Natural History: Sauromalus ater and Dipsosaurus dorsalis. Stebbins, Robert C. 1985. Western Reptiles and Amphibians. Houghton Mifflin Company, Boston. Wynne, Richard H.. 1989. Lizards in Captivity. TFH Publications, Inc., Neptune City, NJ.